Apple has finally revealed all regarding the Apple Watch, the wrist-based wearable it first introduced last September. Many of the Apple Watch’s particulars were already known, but here, for the first time, is a comprehensive look at what will no doubt become the world’s most popular smartwatch. Pre-orders will begin on April 10th. The device will start shipping on April 24th, and cost anywhere from $349 to $10,000 depending on style. The Apple Watch is unique among Apple’s product offerings in terms of just how much variety it offers in terms of buyer options. To help clarify and define the available choices, the company has separated Apple Watch models into three distinct collections: The Apple Watch Sport, the Apple Watch, and the Apple Watch Edition. All three offer both 38mm and 42mm rectangular case sizing options, but materials and finishes vary by collection, as do the band options offered by default. Apple Watch Sport has an anodized aluminum finish, which comes in both space gray and silver. These finishes will actually match most closely with the existing case materials of the iPhone 6 and 6 Plus, because of their matte look. The display of the Watch Sport editions are protected by a special ion-treated durable glass, similar to what is used on the iPhone, too. The Watch Sport will ship with a rubberized plastic sport band, which is averrable in a range of colors. The Sport version of the Apple Watch is the most affordable in the range, but it also is the one that aesthetically most resembles the current iPhone models. Rubberized straps might not suit all tastes, but the interchangeable custom strap system Apple designed for all the watches mean users can easily change those out. The Apple Watch Sport is $349 for the 38MM and $399 for the 42MM model. The Apple Watch is the middle-ground collection of the wearable, with stainless steel casing available in either a shiny polished silver or a glossy ‘space’ black. The stainless steel is paired with a sapphire crystal protective layer covering the display, which should provide additional scratch resistance vs. the basic Watch Sport model. Strap options on the Watch Collection include sport band, leather bands with multiple buckles and a leather loop, as well as a stainless steel link or Milanese loop bracelet. The choice of strap affects the price of the Watch collection. The Apple Watch is $549- $1049 depending on band for the 38MM. The Apple Watch steel 42MM runs $599-$1099 for the same. The Watch Edition uses the same sapphire crystal to protect its screen, but it comes in either rose or yellow 18-karat gold, which partially accounts for its much higher cost. The Watch Edition also offers exclusive strap options, including leather bands and sport bands with special 18-karate gold hardware in finishes matching the case of each particular model. Apple Watch Edition will cost over $10,000. Apple’s Watch has a lot to offer in terms of its watch functions, with various faces with customizable colors and detail views, and software-based “complications” that mimic their namesake on analog automatic and manual watches. Some complications include alarms, weather, sunset/sunrise, chronograph, upcoming appointments, interactive animations and more. Out of the box, Apple Watch will also offer native calendar, maps and reminder integration, giving you glances for upcoming meetings, as well as the ability to accept meeting invites on your wrist. Notifications tell you when to get moving to your next appointment, and the native maps view can provide turn-by-turn navigation on your wrist with a full visual overview of where to head next. Of course, third parties will be able to greatly expand the functionality of the watch with apps of their own. Apple demonstrated apps that allow you to call an Uber, unlock your hotel room door, chat on WeChat, or view Instagram photos. The big button beneath the digital crown allows for quick access to favorite contacts, which you can then either message or call directly from he watch. But you can also draw images to share with contacts, or tap out a pattern with special meaning to the receiving party. 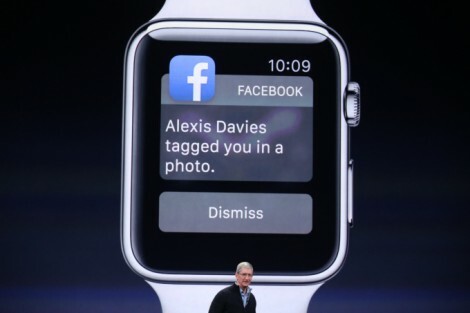 Since the Apple Watch also tracks heart rate, you can send your own direct to a contact, too. Apple also allow you to receive messages and calls, and to respond to them immediately, or to simply lower your wrist to dismiss them. The Apple Watch offers up context-specific responses to inbound messages based on contextual cues, too, meaning you shouldn’t have to pull that phone out of your pocket that often. You can actually take calls on your wrist thanks to the device’s microphone and speaker, as well as triage email, and handoff longer, more in-depth tasks to your connected smartphone. Apple has built a lot of unique features into the Watch so that it can truly supplement the iPhone – there isn’t all that much in the way of duplication, but instead the wearable goes beyond, offering sensors that aren’t present on Apple’s smartphones and tablets. Some of the unique features of the Apple Watch include its taptic engine for providing physical cues and messages, as well as notifications; heart rate monitor and motion sensors for activity tracking; Built-in Bluetooth support for connecting to accessories; and the digital crown, which allows for control without sacrificing screen real estate. While rumors had suggested that Apple was having trouble getting the battery lifespan up to something reasonable, Apple now claims that its watch should be able to handle at least 18 hours of regular use. That’ll vary depending on how you use it, of course — but Apple is content enough with the lifespan to call it an “All-day battery”.